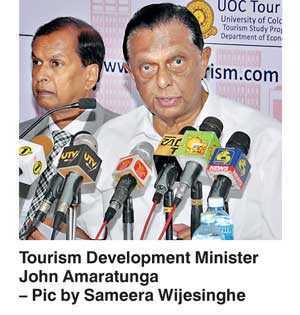 Tourism Development Minister John Amaratunga will award the agreements today to execute the much-delayed $ 3.5 million digital promotional campaign covering five key markets accounting for over 50% of tourist traffic, which is a critical part of Government efforts to boost arrivals to three million by December. The digital marketing campaign is expected to begin early October and would be followed by a $ 40 million global campaign in November. “The Cabinet has now given approval to award the contracts for the digital promotional campaign to position Sri Lanka as a preferred destination in the United Kingdom, Germany, France, India and China. By early October, we will be able to kick off the campaign,” the Minister told reporters in Colombo yesterday. As per Cabinet-appointed Procurement Committee recommendations, approval has been obtained to award the contract to run the promotional campaign in the United Kingdom to Digital Spring Ltd. for a cost of $ 703,480. The contract to run the promotional program in Germany has been awarded to Media Consulta International Holdings AG for a total cost of $ 697,770.92, while the campaign to be carried out in France by Interface Tourism would cost $ 706,460. Following recommendations from the Cabinet-appointed Standing Procurement Committee and Procurement Appeal Board, Cabinet last week approved Havas Media India Ltd. and Ionic Media Institution to carry out the campaigns in India and China, respectively. Upon getting Cabinet approval for the Global Level Tourism Development Project last week, the Minister was hopeful that it would be rolled out by November. “There are so many procedures we have to follow. We have now shortlisted nine bidders. The Standing Procurement Committee will have to select a suitable candidate and submit it again to the Cabinet for approval. After that, it will get off the ground, hopefully by November,” he added. Highlighting the complications in keeping up with the procedures to carryout a global tourism campaign in November at the World Travel Mart (WTM) in London, the Minister said if they fail to meet the deadline, they would have the launch in Sri Lanka. “The procedures are time-consuming and we also had changes of bureaucrats in the Ministry and institutions. However, to meet the deadline and launch the global promotion campaign at the WTM, we have to rush through these procedures. By any chance, if it is getting delayed, we will have a local launch here,” he said. Despite industry and expert criticism, Amaratunga also said they will extend the CNN media campaign by an additional three months with slight changes to the contents, which will run until December. In addition, the Minister said the Sri Lanka Tourism Promotion Bureau (SLTPB) is in discussion with BBC, India Weekly and Al-Jazeera to implement an advertising campaign promoting Sri Lanka Tourism.